If you are an equestrian lover then you will have heard of the Arabian horse. This horse, synonymous with beauty, gracefulness, speed and agility has a rich history dating back to 8000 BC. As the oldest breed of horse and the only true purebred in the equine world, its history and lineage are interwoven with the Bedouins, who are held in history as the supreme keepers of this breed. The Red Sea coastline and desert is in the heart of the Arabian Peninsula. Visit any of the local stables and you will see the distinctive chiseled profile, the prominent eyes and the proud head of the Arabian pure breed. Take the opportunity to go on a guided desert trip on one of these magnificent steeds and let your mind wander about the ancient times of the Bedouin and his precious horse. Thousands of years ago a Bedouin legend was told and passed down from generation to generation about how the Arabian horse was created. The legend goes that "God took a handful of South wind and from it formed a horse as he said, ' I create thee, Oh Arabian& I establish thee as one of the Glories of the Earth& I give thee flight without wings'. The Bedouin tribes believed that the horse was a gift from God and it was imperative that the breed was kept pure over thousands of years. The horse had every attribute they required in the harsh desert. The Arabian is known for it's gentle and affectionate nature, striking looks and proud spirit. It is equally well known for it's stamina and speed while enduring long desert treks. The agility of the Arabian horse is legendary in tribal conflicts. To this day, the Arabian horse is exceptionally similar to its ancestors. However, it has evolved to be slightly larger, lighter and smaller in comparison to other breeds. On average it stands between 14.1 to 15.2 hands and weighs between 800 to 1,000 pounds. Apart from its distinct looks, the horse has a unique physiology. The breed has 17 ribs, five lumbar bones and sixteen tail vertebrae. All other breeds have 18 ribs, six lumber bones and eighteen tail vertebrae. Another unique aspect of the breed is that the stallion is held in higher esteem than the mare. Lineage is passed on the stallion side. Yet, the Bedouins still regard the mares as the prized possessions in the herd. "Mares were the best mounts for raiding parties, as they would not nicker to the enemy tribe's horses. To this day, the lineage of the Arabian horse is traced back along the dam line. The ancient Bedouins can be credited with purity of the breed today. The tribes passed down the breeding records by word of mouth and any Arabian horse can be traced back to "desert breeding, which mean there is no written record. Due to the importance of the purity of the breed, the Bedouin system of "'desert breeding is an accepted authentic verification of the bloodline. The Bedouins are held in high honor as the first caretakers and protectors of the Arabian horse. They fervently guarded their integrity and were careful to prevent cross breeding with the 'kadish' stallion. It was strongly believed that once a mare had been bred with an outside stallion, the mare would forever be contaminated and could never produce a pure-breed again. Five basic strains of the Arabian have emerged. Collectively known as 'Al Khamsa they consist of Kehilan, Seglawi, Abeyan, Hamdani, and Hadban. These are strains not cross breeds. The names are derived from different tribes or the Sheikh of the tribe. The Arabian horse has a rich history. The Bedouins were the first to domesticate this magnificent breed. As time went on, the word spread about 'the horse that can fly without wings.' These horses are noted in the tombs and temples of the Pharaohs. Pharaoh Thotmose III and his son Amenophis, Ramses II and Pharaoh Piankhi have inscriptions depicting pure Arabian horses. Throughout the history of Egypt the Arabian horse is mentioned. Prophet Mohammed said, "'every man shall love his horse. The Mameluke, conqueror of Ahamad Ibn Tulun built palatial gardens for his collection of horses. In 1798, Napoleon overthrew the Mameluke Empire and discovered the amazing Arabian. The breed captivated him. After the French left, Mohammed Ali the Great ruled Egypt. He is attributed for founding one of the greatest Arabian stud farms and establishing the continuity of the breed. The Pharaohs of ancient Egypt, the Bedouins, Napoleon, George Washington, Genghis Khan and Alexander the Great rode Arabians as their mount of choice. If you are an equestrian lover, then don't miss the experience of your own desert trip upon the purist breed of horse in history. Check out the local stables around your resort or ask the excursion desk for more information. 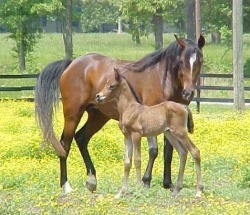 Many stables are located in large hotels and the horses are healthy and taken care of properly. All desert trips and beach rides usually include a guide - which is recommended. Make sure to wear something comfortable. Jeans are usually the best. If you are planning a sunrise desert ride, make sure you bring a jacket, a sun hat and plenty of sunscreen. If you are planning for an evening or moonlight ride, even on the beach, make sure to bring a heavier jacket and a warm hat.